George Washington’s Sacred Fire—in which Peter A. Lillback argues that “founding father” George Washington was a Christian and not a deist—garnered a great deal of media attention when first published in 2006. On amazon.com the book currently enjoys 165 user reviews, from readers asserting that the book is “awesome” and “indispencible” [sic] to readers asserting that the book is “illegitimate,” “junk,” and “propaganda.” Why does it matter if George Washington was a deist or a Christian? What’s at stake in the application of one of these two labels onto a figure long dead? George Washington was a man of honor and this book brings that out. We need another President like him. All these haters because it has conservative points of view? Guess what, our founding fathers were more conservative than all but a handfull of republicans. We’re becoming a “sissy version” of what we once were. [Washington’s] devout belief in Divine Providence as it relates to the founding of this nation was unshakable. An inspiration to anyone who has even just one patriotic bone in their body. Makes you want to be involved in taking America back from the lying looting thugs!! Our contempary congress should take a clue from him. Good for the kids to read inorder for them to know why America was founded and why we need GOD back in our country. George Washington, the father of our nation must be in turmoil over what we have done to our nation. His moral character, and dependence on our holy father, Jesus, made him the man he was. We have much to learn and much to do to come within a mile of this mans integrity. Clearly, for many readers this book serves as a useful moral guide and a return-to-origins narrative. 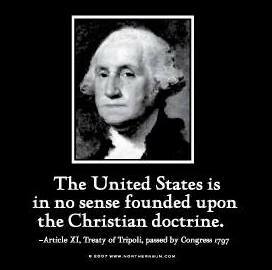 The U.S. has gotten away from its authentic, Christian origins—modeled by Washington—and we must turn away from our corrupt detours and return to Washington’s ideal. The quotation is not, however, from Washington; it was written by Joel Barlow, approved by the U.S. Senate, and signed by then-president John Adams in 1797. But the quotation seems to serve the same purpose: it proposes an alternate origin to the American nation—this time a non-Christian origin—that presumably is to serve as an ongoing model for American politics or policies. We are not and never were a Muslium nation even though Pres. Obama said “if you actually took the number of Muslim Americans, we’d be one of the largest Muslim countries in the world”. What is he talking about? The idea that the United States is a ‘Christian nation,’ has always been central to American identity. The majority of Americans (73-76%) identify themselves as Christians. What we have are two competing visions of America, then: one according to which there is nothing Christian about America and, therefore, nothing intrinsically at odds with Islam; another according to which America is intrinsically Christian and, therefore, there might presumably be something wrong with the number of Muslims in America. Of course, none of this gets to how the readers in question define “Christianity” or “deism” (or “Islam,” for that matter.” One reader of Sacred Fire suggests that, despite Lillback’s assumption that “Christian” and “deist” are mutually exclusive, this could be a “false dichotomy” and it’s possible that Washington could have used both identifiers simultaneously. Another reviewer suggests that the author of the book deploys an anachronistic portrayal of what counts as “Christian”: “The TESTS of being a real Christian are based on their 21st Century Evangelical definitions of a Christian.” Not only is the definition of “America” at stake here, but so is the definition of “Christianity.” Perhaps Lillback’s next book will be on the so-called historical Jesus, in order settle that question for his readers. Such return to origins games require a process of selection; even if Washington was “Christian”—whatever that means—it’s nevertheless clear that not everything associated with Washington will continue to serve as a model for modern America. For instance, Washington owned slaves, but I doubt few of the readers who offered five star reviews of the book want to resurrect slavery. So which parts of Washington’s life—or, rather, what we can project backward in time as his “life”—will be selected as our ongoing model? Of course the answer to this question depends on individual readers’ sympathies. Next PostNext Which Norms are Religious Norms?